Full Tilt Poker made a big to-do with their 5th anniversary celebration. The festivities were suppose to culminate with the #2 online poker site breaking the Guinness Book of World Records, record for the largest online poker tournament, which was owned by their chief rival PokerStars. The only problem was PokerStars was unwilling to go quietly into the night, and the #1 online poker site decided to throw together a record-breaking tournament of their own: On the same day as Full Tilt’s attempt. 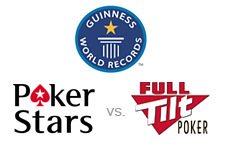 Full Tilt broke the record (easily), but PokerStars immediately reclaimed the title a few hours later. Well the two online poker giants are at it again. This time the two rivals are competing in the Poker Game Show/Reality TV genre. NBC and Full Tilt Poker recently unveiled a prime-time poker show, Face the Ace, where everyday people square off against poker giants in a Deal or no Deal/Who Wants to be a Millionaire type format. The show has met with mixed reviews and has been an overall ratings disaster for NBC. Not to be outdone, PokerStars has just announced they will be teaming up with Fox to produce a similar show, the PokerStars Million Dollar Challenge. The show will air in the 4pm time-slot on Sundays, beginning in October (with the ratings Face the Ace has garnered to this point, PokerStars may be competing against themselves come October). This entry was posted on Friday, August 21st, 2009 at 7:13 pm and is filed under Poker News. You can follow any responses to this entry through the RSS 2.0 feed. You can leave a response, or trackback from your own site.